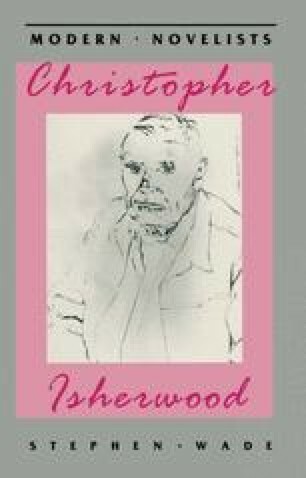 In his first two novels Isherwood had kept very close to his own biography and had used this material as a basis for exploring questions of moral identity and crisis for his contemporaries. In Lions and Shadows he wrote an autobiography that he stated should be read as a novel. This blurring of the distinction between the novel, autobiography and reportage was characteristic of the time, and was to become one of the most creative and innovative developments in the structure and scope of the novel throughout the thirties. Part of the impetus for this was, of course, the demand for factual information about foreign or sub-culture lifestyles. There was a new reading public which had literary and journalistic taste; there was a deep interest in films, and particularly in documentary films of working-class life. The rise of Fascism and Communism added to this fascination with other ways of living and organizing communities than the traditional English way. The restless generation of young people of Isherwood’s age wanted to travel and to read about travels. The decade brought about new approaches to travel writing and this in turn had some influence on how the novel of social realism was to be written. Auden and Isherwood were commissioned to write a travel book at the end of the decade, Journey to a War (1938), but long before this Isherwood had understood and practised the art of mixing elements into one fictional framework: close observation, factual detail and informative dialogue would be his best tools for the task.